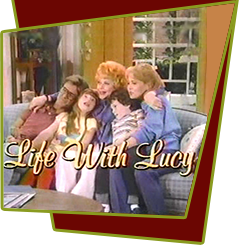 In 1986, the very short-lived Life With Lucy aired, this time with Lucille Ball playing a Grandmother. Life With Lucy co-starred her friend, Gale Gordon, along with Donovan Scott, Larry Anderson, Ann Dusenberry, Jenny Lewis and Philip J. Amelia. Lucille Ball, now 75 years old, plays Lucy Barker, an energetic, health-conscious grandmother who comes to live in South Pasadena with her daughter Margo, son-in-law Ted and their two kids, Becky and Kevin. Back to play in the show was 80 year-old Gale Gordon, who plays Ted's father as well as Lucy's deceased husband's partner, Curtis MacGibbon. He also moves into the house during the first episode. Curtis runs a hardware store, M&B Hardware, in South Pasadena, and Lucy decides since she inherited half ownership when her husband Sam died, that she'll 'help out' as partner at the store. Life With Lucy was canceled after only two months (8 aired episodes total) due to anemic ratings that kept getting worse as the weeks wore on. This may have been possibly due to the Saturday night airing as well as the acting of Ann Dusenberry who played Margo and Larry Anderson who played Ted, which was not up to par with the comedic genius of Lucy. Sadly, an aging Lucy found it difficult to attempt the kind of serious physical comedy and split-second timing at which she had once excelled, and she recognized that to do so would result only in a caricature of herself. Four episodes were filmed that were never shown during the original network run. Aaron Spelling, who produced the show, donated all the episodes of Life With Lucy to the Lucy-Desi Museum in Jamestown, New York. The show was inspired by the success of The Cosby Show (1984) and The Golden Girls (1985) the previous season. Producers felt that Lucille Ball, a past TV star like Bill Cosby, could revive her career with a family sitcom. Lucy demanded complete creative control, no pilot requirement, and no audience testing. ABC agreed to these demands due to her previous television successes. Gale Gordon was lured out of retirement by Lucy to be her co-star again. Gordon joined the show on the condition that he be paid for an entire season even if the show was canceled quickly. Audrey Meadows was asked to join the cast after her successful guest appearance but she turned the offer down. The pilot made Nielsen's Top 20 for the week. Unfortunately, ratings for subsequent episodes dropped steadily, ultimately turning the show into one of the biggest flops in television history. Reportedly, its failure hurt Lucille Ball so deeply that she never completely recovered, convinced that the public no longer wanted her. Producer Aaron Spelling blamed himself for the failure of the show, stating that he should have never granted Lucy creative control. Spelling knew something was wrong when the studio audience in attendance during the pilot gasped when Lucy was doing a physical stunt, fearing she would get hurt. Spelling would never produce another sitcom again, saying "If you're gonna fail with Lucille Ball, you should not do comedy."